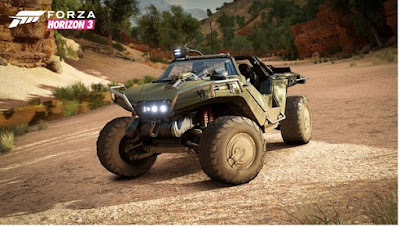 The Halo Warthog belongs to a wide range of vehicles in Forza Horizon 3 (FH3) and there are easy ways to get it and one in which you need a little more patience. If you are a fan of the Halo series and already have Halo 5: Guardians or the Halo: The Master Chief Collection played before the release of FH3, then you should check your e-mail inbox and look for a mail from Microsoft. If you have played one of said games then the code has already been sent to you to unlock the Halo Warthog. If you are not a fan of the Halo series on the Xbox One, but still want to unlock the Halo Warthog then you have to participate the Forzathon event. - Forzathon events will take place in October or November in Forza Horizon 3. -These events will be available for a limited time. You can finish them and get the Halo Warthog as special reward. - To unlock the Halo Warthog, you have to win a race in the "King and Flag Rush" mode with an off-road vehicle. By winning the event, you also unlock the new Achievement "Looks More Like a Puma". So keep an eye on for these future events to grab the Halo Warthog.